Okay, so when we left off we had just returned from Kyaiktiyo to Yangon via a bus. From Yangon, we had a flight to Sittwe in Rakhine State, but we had basically two days in the capital before flying off. Actually: Yangon is no longer the capital of Myanmar. The British had moved the capital from Mandalay to Rangoon in the nineteenth century; the capital remained there until 2005, when the military decided that the capital should be more centrally located and made an entirely new capital from scratch between Madalay and Bagan called Nay Pyi Taw. (There is plenty of regional precedence for this: Bangkok was created in much the same way, albeit after the previous Siamese capital had been sacked by the Burmese.) Nay Pyi Taw sounds amazing, but we didn’t go there (no one really does who’s not involved with the government in some way) even though they have 24-hour electricity. Anyway, Yangon is still the major city of the country, even if it isn’t actually the capital anymore. People seem to say not very nice things about Yangon, but that doesn’t seem particularly fair. It’s true that hotels there are extremely expensive for the region, mostly because there’s a real estate rush going on and the town is full of seedy foreign businessmen trying to buy everything up. The traffic is bad, but not nearly as bad as Bangkok; also most of the traffic is taxis, which are cheap and driven by drivers who seem less lunatic than their Bangkok equivalents. Physically, it’s a lovely old city which seems like it would repay a longer stay if there were a cheaper way to do it. It also does seem like a city undergoing massive transition at the moment – if we were to come back in a year, I suspect parts would look entirely different. After that we stumbled around – Yangon does not really have street lights – until we found a place to have dinner, where we had a delicious Burmese dinner. Then we went to bed. The next morning after a delicious breakfast of congee – Burmese congee is served with fried garlic, scallions, and peanut oil – we went on a walking tour of downtown Yangon, starting at the Sule Pagoda, which is also old and beautiful but not as full of pilgrims as the Shwedagon is. (Burmese Buddhism is conservative, and Kim’s dress was scandalously short, so she was given a skirt at the door.) One thing that is nice about many Burmese pagodas is that they are octagonal, and each side is for one of the days of the week: Burmese Buddhism recognizes an eight-day week, with Wednesday being split into Wednesday morning, when the Buddha was born, and Wednesday afternoon, when he was not. But there’s a shrine for every day, and people go to the shrine for the day of the week on which they were born. You see this occasionally in Thai wats, but it’s not nearly as prevalent. Here’s Sule Pagoda from the south: there’s a park to the south with nice gardens and a playground which Harriet appreciated, of course. They have an astonishing number of hippopotamuses. Obviously the Bangkok Zoo has splendid hippopotamuses, but Yangon has them beat on sheer numbers – basically everywhere you look there’s a hippopotamus enclosure with more hippopotamuses in it. And if you keep going, you eventually see this enormous palace made in the shape of two ducks. After that we went home. The next morning we went to the National Museum, which is pretty good (better than the Thai one, not as good as the Cambodian) but doesn’t allow any photographs. Then we went to the airport and got on a flight to Sittwe, which is going to be a post all of its own because this is already too long. Okay, so we went to Myanmar, the country formerly known as Burma. The military regime changed the name to Myanmar, which everyone frowned upon, but it is maybe a better name: “Burma” referred to a specific ethnic group, once known as the Burmans (cf. the derived “Burmese,” which refers to the country as a whole or its language), though there are a great many people living in the country who are not Burmans and would not want to be confused with them. Also Thailand has its own military regime now, so we are not really in any position to judge. I will stick with “Burmese” because although they call their language “Myanmar,” there’s not a graceful adjectival form of that in English. There’s a big long page of Wikipedia where you can learn all about this if you are so inclined: it turns out the British inability to pronounce the letter “r” correctly has messed things up seemingly irretrievably, in a manner no dissimilar to the monstrosity that is transliterated Thai. But. It turns out that there are very cheap flights to Yangon, the city once known as Rangoon, and so we decided that we should spend two weeks in Myanmar. We mostly neglected to do any kind of planning for this; further, it’s basically impossible to do much planning for what you’re doing in Myanmar when you are outside of Myanmar. Buying flights inside the country, for example, is an exercise in futility: the various Burmese airlines have websites that look like they were made by eager twelve-year-olds that allow you to reserve seats, but not buy them, on flights, but invariably after reserving these seats I would get back an email declaring how sad they were that there was not actually any space at all. Also email to anywhere in the western part of the country basically failed entirely. But we were able to book a room in Yangon and we had a rough idea that we wanted to go to two major regions of the country and one side trip from Yangon. So this first part of the narrative is about our time in Yangon plus a daytrip to see a big rock. We arrived in Yangon very late on Friday night and that was where our problems began. Everyone said you should bring American dollars to Myanmar, but we didn’t really have stacks of dollars lying around, and I also assumed that it might be like Cambodia, where the ATMs dispense American dollars. This is not the case. The ATMs, when they work, dispense kyat, the Burmese currency. There are roughly 1000 kyat to the dollar, and the most common big denomination is the 5000 kyat bill (later we would discover the 10,000 kyat bill, but that took a week) and so if you get out a few hundred dollars you have an enormous stack of paper and you look ridiculous. 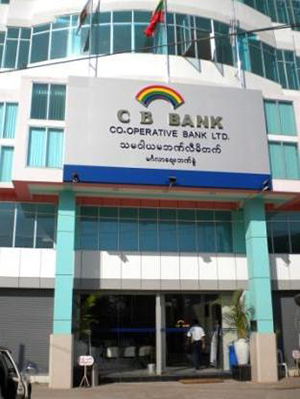 One problem with Myanmar is that while there are ATMs around (the cheerfully inept logo of CB Bank being my favorite), almost nowhere takes credit cards at all. This problem is compounded by hotel rooms being weirdly expensive in Yangon: the town is full of businessmen trying to make a quick stack of kyat and there is not enough room for them all to stay. So you need to have a ridiculously large number of bills to pay your hotel bill and the end result is like you’re using your penny collection to buy a week’s worth of groceries. The main problem with taking the bus is that you have to go to the bus depot, which is the size of a small city and deeply confusing. I became indignant when told I had not bought tickets, though probably I had not, and also the tickets were only $4 apiece, so that was ironed out. The problem with Myanmar is that people are not really trying to trick you, though it takes a while to work out how this works, and in the meantime things are confusing and you worry that you are being tricked for tiny sums of money and it’s a little embarrassing. But I had a delicious salad made of some kind of pomelo and a lot of garlic, and Harriet realized that the buses in Myanmar are deeply intertwined with the consumption of boiled quail eggs and everything was more or less fine. So we got on the bus and went to Kyaiktiyo. The bus ride was not without incident – it did not stop for a bathroom break with semi-disastrous results for Harriet and Kim’s pants – but we had obtained Dramamine before leaving Bangkok and so there was no throwing up in mountainous regions. I will just break the dramatic tension right now and note that this was an upchuck-free trip, which was something of a triumph. Other things did happen so you can keep reading. Kyaiktiyo is on the east side of Myanmar, at the top of the little leg that goes down to Malaysia alongside Thailand. It’s the site of a Buddhist shrine, which is a gold-plated boulder at the top of a mountain. Everyone in Myanmar goes to pay their respects to this boulder; you see pictures of this particular boulder all over the country. So we thought we should go see it too. It turns out that we are not the only people who wanted to do this, but some of the only people who were not Burmese. Kyaiktiyo isn’t exactly a tourist trap – the boulder is kind of astonishing – but the town around it does seem to revolve around souvenirs. These souvenirs consisted of: 1) t-shirts saying “Kyaiktiyo” in various ways; 2) wooden guns and swords; 3) dried fruit; 4) some other dried substance that might have been tea, if the tea bush was buried under the ground for many years; 5) folk medicine in liquor bottles. We did not particularly need any of these things so there wasn’t much for us in the town. But that was basically fine because we were all exhausted and didn’t feel up to doing very much. It’s kind of nice to be in a town where there’s not much to do sometimes. It was a watermelon-growing region, so you could get a lot of watermelons. Also, stray dogs. From below, you can see the golden boulder: it’s the dot on the side of the mountain. Our hotel was actually a little outside the town, which made things somewhat quieter: there were fewer pilgrims buying wooden guns and dried fruit outside our door. These enormous trucks ferry people up and down the mountain all day. There are rows and rows of tight-packed seats in back and you sit in them and hold on to your fellows and hope that you don’t go flying out. As it was early in our time in Myanmar we decided that we would do the boring thing and pay 3000 kyat each to sit in the front seat, as five lucky people can on each truck. How all this worked was deeply mysterious but eventually we were put in the front of a truck and the truck started going up the mountain. This ride is, to say the least, somewhat harrowing. The trucks whip back and forth across a very narrow road going up the mountain while trying to avoid all the trucks coming down the mountain on the same road. It was reminiscent of a trip to the foothills of the Himalayas in Himachal Pradesh a couple years ago where we similarly thought we were going to die, though then it was just us, not also the 64 pilgrims in the back of the truck, the death of all of which at least would have made it into the news, I guess. It’s basically a miracle that anyone makes it up the mountain, but we did not see anyone dead. At the top, there’s a carnival atmosphere, perhaps because everyone is overjoyed that they didn’t die on the way up. There are people selling dried fruit and regular fruit and if you are supremely lazy or bedridden you can get people to carry you the rest of the way in a sedan chair. We did not do that. The lion-dogs you see in that picture are called chinthe. You see them ornamenting pagodas everywhere in Myanmar. These may have been our first. Wikipedia has an confusing Oedipal legend about their origin which is almost certainly mangled. At this pagoda, as at most pagodas in Myanmar – there are more pagodas in Myanmar than you can possibly imagine – there are bells that can be rung by the youth, who rang a lot of them, to the delight of the pilgrims. The boulder itself is covered in gold leaf, which men are invited to apply. It is very large. You notice when up that high that there are a number of other gilded boulders that can be seen. This one is particularly important because it is held in place by one of Buddha’s hairs – we would see a number of Buddha’s hairs, or rather the pagodas that contained them, this trip. After this, we had some kind of a drink with noodles in it which Harriet promptly spilled in my hair. Then we raced back to our hotel to get the bus back to Yangon; I sat next to a pushy monk but the trip back was much smoother than the trip there & we arrived back in Yangon that afternoon. More later. We went to Bagan and though I was stung by a bee on my toes and had a terrible adventure with an electronic bicycle we are still alive. We are spending one more day in Yangon, then it’s back to Bangkok tonight. At the moment we are back in Yangon – we flew to Sittwe and then took a boat to Mrauk U and came back. This evening we’re heading to Bagan. In the meantime, here’s Harriet on the beach – behind her is the Bay of Bengal. We are in Myanmar, where there is not electricity all the time but there is, sometimes, the internet. Today we went to Kyaiktiyo to see a big golden rock, Harriet poured some kind of sweet noodle drink on my head, and we came back to Yangon. So we are having a fine time! We will have a fuller update at some point.